Update 15 July 2016: I received an email from TD Ameritrade, Inc. stating that my account will be closing on 4 November 2016 because TD Ameritrade, Inc. has made the business decision to no longer offer brokerage services in my area, notably Malaysia. I choose the option one which is to open an account with TD Ameritrade Asia Pte. Ltd. (“TD Ameritrade Asia”) which is located in Singapore. For those (Malaysians or Singaporeans) who wish to open an international trading account with TD Ameritrade, you can go straight to www.tdameritradeasia.com to open your account. However, be warned: A lot of paperwork is required. This is a long overdue post that talks about the steps to open an international trading or investing account with TD Ameritrade (a US broker) for someone that is not a US citizen. The steps to open an account are really straight forward. They can be summarized in one paragraph: First, you need to go to their website and fill in the form and print it out, sign and send it back to TD Ameritrade together with other supporting documents. It takes time to open the account. In my case, it took more than a month after sending the documents from Malaysia before I finally received the welcome email from TD Ameritrade. Then, you will need to wait for another month for the pin that they will send to you via post before I could log into my online account. TD Ameritrade does not require any deposit to open an account which, in my opinion, is quite “friendly” for those who just want to try out. I went to this page. Filled in the online application form accordingly. I wanted an individual account. You can leave the SSN/ITIN and Foreign Tax ID fields empty. For cash sweep vehicle, I chose “TD Ameritrade FDIC-Insured Deposit Account”. Once done, printed out the application form. Ticked the 4 “Agree” check boxes in the form under the client agreement section. Signed and dated. Downloaded the W-8BEN form and filled in only the part I and part III sections. Then printed out the form and signed with date. 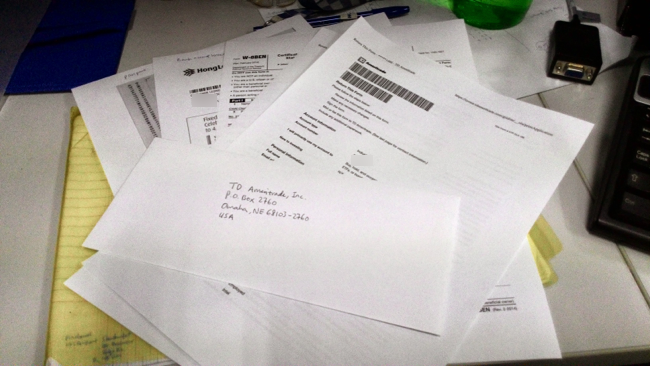 Next, made a photocopy of my latest bank statement that shows the current address and a photocopy of my passport. 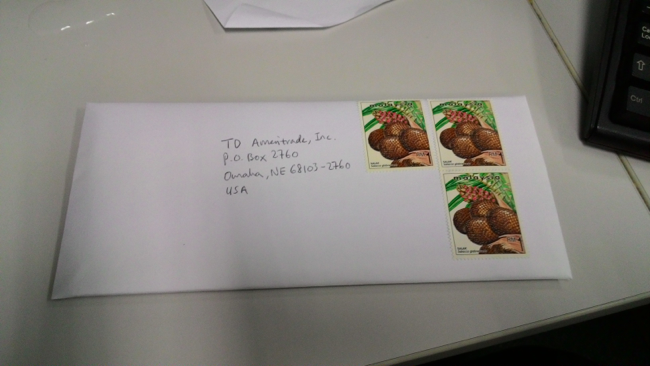 I sent the letter on 23 January 2015 (Friday) with RM 3 stamps. I received the welcome email on 28 February 2015 after a full 36 days of waiting. Before I could create an online account I need a four digit PIN from TD Ameritrade. The PIN arrived on 19 March 2015 (another 19 days after receiving the welcome email). With the PIN and the account number, I could proceed to register an online account. There was a few security questions and answers that I need to provide during the registration. Every time I login to the online account, I will be asked one of the security questions to confirm my identity. Then it was time for deposit. Follow the Wire In Instructions. Credit the Account of TD Ameritrade, Inc. The funds will be sent through an intermediary US bank. If your bank asks for a SWIFT code, it is FNBOUS44XXX. Wire transfers can only be made from a bank account where the TD Ameritrade account owner’s name is listed. Wires from a differently titled account may be rejected. They do not accept third-party wires from business accounts. It takes about 2 to 3 days for funding the TD Ameritrade account. The number one reason is that TD Ameritrade is ranked number one for long-term investing by Barron’s. It welcomes international investors and it has no minimum requirement for deposit when opening an account which makes it easy for everyone to open an account and access to its platform. There is no barrier of entry. Each online equity trade has a flat-rate of $9.99 but it also offers 100+ commission-free ETFs. I was mainly attracted by its commission-free ETFs where I don’t have to pay any fee or commission or $9.99 when buying and holding the ETFs (there are terms and conditions applied: you need to hold the ETF for at least 30 days to avoid the commission). However, most other online brokers also have commission-free ETFs from different ETF providers. For more reasons, visit Why TD Ameritrade? With current market conditions where Malaysian Ringgit is weakening and oil price is at its low, it is ever more important to diversify into other markets like those in the US and other countries. Some even suggest to avoid Malaysian stocks. What do you think? This entry was posted in Investment on April 11, 2015 by Chok Leong. How would you deal with the 30% withholding tax on dividends? Good question. 🙂 I just started investing with TD Ameritrade about less than one month ago, therefore I don’t have any experience dealing with the withholding tax yet. 1. The 30% withholding tax is deducted from the dividends before it is paid to your account. Therefore you don’t have to declare the tax ( http://money.stackexchange.com/a/18777 ). 2. Malaysia has a double taxation agreement with the US. You can find get the formula to calculate the tax withholding ratio here https://www.bogleheads.org/wiki/Nonresident_alien_with_no_US_tax_treaty_%26_Irish_ETFs#Calculating_tax_withholding_as_a_ratio . The total expense will still be less than 1%. 3. Someone even did an experiment with TD Ameritrade to get a clearer picture about the impact of the withholding tax: https://www.bogleheads.org/wiki/Nonresident_alien_taxation#TD_Ameritrade_tax_withholding_experiment . Can you share with me the 30% withholding tax? Is that alot? Do I need to declare to LHDN about investing in US? AOA paid $4.88 in dividend on 13 of July 2017. 30% of the dividend ($1.46) was withheld for tax purpose. I received $3.42 in dividend (which was reinvested into AOA). VT paid $4.77 in dividend on 6 of July 2017. 30% of the dividend ($1.43) was withheld for tax purpose. I received $3.34 in dividend (which was reinvested into VT). 30% withholding tax is the cost of investing for dividend in the US. It is the cost of doing business in the US. You don’t have to pay tax in Malaysia since the income is not earned in Malaysia. So I “think” you don’t have to declare to LHDN about your foreign investment. Thanks for your reply. What is your mode of deposit? What are the charges from Malaysia bank to foreign account? I use cheque (only available for Singapore bannk account) to deposit to TD Ameritrade Asia. The charge is usually around 1% of my deposit. The cost is mostly due to the currency conversion rate. Very helpful article, especially for new traders like myself, thanks. I have one question though. In item 10, you provided a link. The TD Ameritrade address stated in the link is different from the address you provided in item 10. Which one to use? 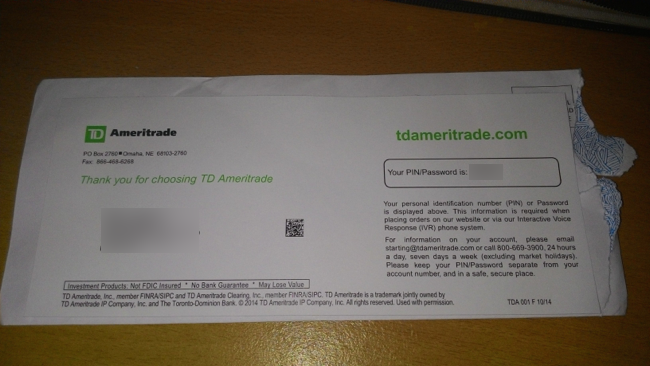 FYI, the lady at my local bank asked for TD Ameritrade’s details for doing TT, if I showed them the form in the link you gave, will they allow me to wire to the other address you wrote instead? If you compare closely, both addresses are actually the same (the one I showed in the post and the one in the pdf link. They are different only in spaces and some additional details.). I actually copied-pasted the content from an email reply from TD Ameritrade customer service into my post. In case you have any doubt, you can send an inquiry to the TD Ameritrade support https://invest.ameritrade.com/grid/p/login (click on “Send email”). The reply will be in minutes. FYI, I provided the pdf to my banker when I wanted to transfer money to TD Ameritrade. Of course, you must provide your TD Ameritrade account number in the pdf form to your banker. I also provided them the SWIFT code. The wire transfer took about 3 days (21 March till 24 March 2015) in my case. Credit the account of TD Ameritrade Clearing, Inc. Section 3 in the pdf also says “an intermediary U.S. bank is needed” for foreign wire transfers. Should we care about this statement? Can we wire directly from local Malaysian bank accounts to the stated address? Do you have an TD Ameritrade account already? You only wire the money after you had opened an account. Else you will get charged unnecessarily if your wire transfer got rejected. The statement in the section 3 can be ignored. However, you need to make sure the name used to open account at TD Ameritrade is the same name of the bank account you transfer money from which means your name. Else the transfer will be rejected. Edit: hmm, I need to clarify something. I actually made the transfer from France to TD Ameritrade. I have yet to try to transfer money from Malaysia to TD Ameritrade (so I am not sure if the process is the same). I think the safest step to take will be to ask the customer service at TD Ameritrade to confirm first. They are very responsive (check the email link in my previous comment). Thanks for all the help, I’ll check with TD Ameritrade. Thanks a lot for sharing. I have a question though. I am very new to investing. As far as i know, CIMB investment account also offers international trading such as US, Hongkong…so why do you bother to open an account with US broker? It is for diversification purposes. TD offers more choices like exchange-traded-funds, ETFs (this is my main reason to open the account which is to buy international stocks/funds). Besides, its cost is lower if you buy individual stocks from TD $ 9.99 compared to itradecimb $ 25. But itradecimb does not have international ETFs. Both have different features. I have another question to ask. They mention that you can either mail or fax the application to them. If i fax, any chance that the process will be faster? I am just about to send all the documentations to TDA. Do i need to cross the documents like passport and bank slips (eg for credit card application we normally cross them)? Thanks! Hi. I don’t understand what you mean. Is it making a cross “X” on the documents? No. I didn’t do that. So I think you don’t have to do that too. How about withdrawal money? Is there any problem if you want to transfer the money back to Malaysia? Can we keep the money after disposal of shares in their account with earning interest? I never have chance to withdraw money yet from TD Ameritrade. Based on what I see from the dashboard there are 3 options for withdrawing money: 1. Electronic (ACH), 2. Wire and 3. Check. For option 1, it is free but only for those living in America. For option 2, we need an international wire transfer and therefore we need to fill in this form first https://www.tdameritrade.com/retail-en_us/resources/pdf/TDA922.pdf . Based on the issues I found from the internet ( http://www.elitetrader.com/et/index.php?threads/wire-transfer-trouble.227883/ ), the problem will most probably be caused by the US Patriot Act to prevent money laundering or terrorist purposes. You will need to provide very specific detail for the purpose of the withdrawal. The charge should be around $ 30 per international wire. For option 3, I think it is the most straight forward option. I just tried the online form and almost submitted a request. The check will be sent to the address in their record. The cost is free if not mistaken unless you want overnight service. Your money at TD Ameritrade is either in cash balances or in positions (holding shares or funds). You will almost definitely have money in the cash balances because it will be hard to be 100% in shares. Yes, the cash in the cash balances will bear interest however the current rate is very low about 0.01% https://www.tdameritrade.com/pricing/margin-and-interest-rates.page . “Current address” is a US address or msia address? “Current address” is the address you use to fill in your TD application form (and the W-8BEN form). In my case, it is a Malaysian address. I myself write a financial blog so I read a lot of stuff online. I would rate your post as one in a thousand – really very helpful. Great stuff… I could not find this described so well anywhere else on the internet…. It looks new and is only about a month old (the earliest post I can find was dated 21 October 2015). I admire your productivity to come up with some many articles within a month. I learn new things by reading them. Keep sharing, I already added your blog to my regular reading list. I have done 14 articles in the last one month, most of them in the 1400 – 1600 word range. As you know I just started this blog and will continue to look up to experts like you for guidance. 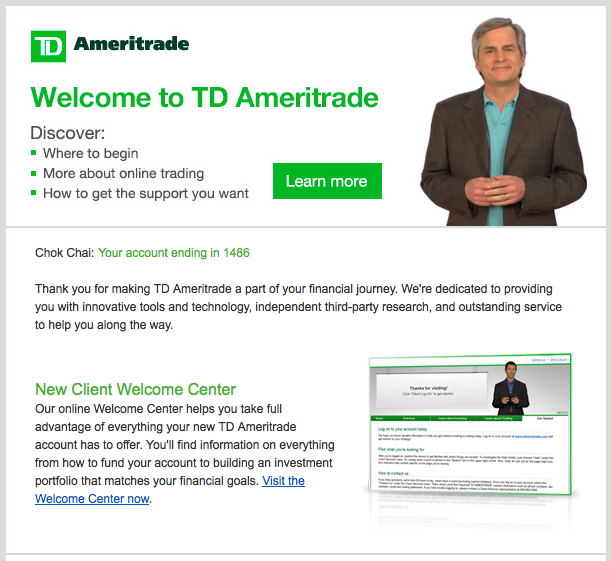 Hi again CL – so someone known to me abroad is trying to open an account at TD Ameritrade. They are asking for “Foreign tax identifying number” – item 6 (part I) of W8BEN. 1. Did you (and/ or others known to you) had to provide Foreign tax identifying number? 2. Is there a reliable source to find out if TD Ameritrade will report this account/ income to the home country? My guess is ‘No’ but still would like to know if any official documentation exists on the matter. 1. So since I am living in Malaysia and Malaysia is not in one of the treaty countries, I didn’t have to provide the foreign tax identifying number. And I don’t know anyone around me who provided that number. 2. I not sure about this. I also guess “no”. There is two options for “FDIC INSURED DEPOSIT ACCOUNT CORE NOT COVERED BY SIPC”, and “TD AMERITRADE Cash – protected by Securities Investor Protection Corporation (SIPC) coverage applicable to the account against brokerage failure (up to $250,000).”. Why you choose FDIC, not covered by SIPC? The insurance is only applicable to the un-invested cash. Conclusion is: They are both equivalent. Is this https://www.irs.gov/pub/irs-pdf/fw8ben.pdf what you mean by the W-8BEN form? I’m confused about the part 7 Reference number in the W-8BEN Form.Would you mind clarifying it to me? If you were using your own name in line 1 to open the account, you could ignore line 7 (by leaving it blank). If you were not using your name in line 1 to open the account, for example you used the name of another person as an intermediary, you could provide the reference in line 7. Thanks for your valuable help! Did your bank statement was in english? Mine was in both English and Malay (Bahasa Melayu). Thanks very much for the update, CL! 1) what are the hidden charges, is it really 9,99 US dollar? 2) Possible to open a savings account when we open an trading account? For my case, I am only interested in Commission-free ETFs where there is no charge at all. The only major hidden charge that I can think of is the conversion rate between different currencies. There is no info about how bank decides what rate to use. Be prepare to be charged at least 1% or more for the conversion when you transfer money (e.g. : RM to USD) to TD Ameritrade unless you already have the US dollar. On the TD Ameritrade application form it asks you to select a Visa Type. What did you put in there? I assume you’re not a US resident? Never mind, I found that there is an option to select ‘None’. Not sure if this explains the situation: http://www.aussiestockforums.com/forums/showthread.php?t=25382 It states that TD Ameritrade decided to discontinue all australian operations since 2013. Yes, I had seen this in the past. TD did shut down their subsidiary in Australia and thus, their customers couldn’t trade on TOS any longer. That doesn’t necessarily preclude them from taking customers from Australia. They seem to have no trouble taking customers from NZ or, as in your case, from Malaysia, even without having official representation there. I put “None”. And I am not a US resident. The world is getting smaller. hi, thanks for your good sharing on opening of TDAmeritrade. From your experience, what is the most efficient way in terms of cost and time, to transfer amount into TDAmeritrade? How long does it take for the deposit to be reflected in the trading account? Also, maybank2u has a RM10000 foreign transfer limit, does this limit apply to maybank counter as well? Also, does the receiving bank charge any fees when the incoming wire is received? 1) From account in France to TD Ameritrade, it took 4 days (including weekends, the transfer was initiated on Saturday) for the fund to appear in my TD Ameritrade account. The cost is dependent on your bank. Different cost for different amount in my case. 2) This one took longer: 6 days from UBS to TD Ameritrade. As far as I know the cheapest cost of transfer is using the ACH electronic transfer which is free if you have US bank account. That said, I don’t know any other faster and cheaper option. It depends on your bank. At the Maybank counter, it should have higher limit. If Maybank2U has transfer limit, you can do the transfer in several times. Just like when you want to withdraw cash from ATM, if the amount you need (e.g. RM 6000) is greater than the RM 5000 limit, you withdraw 2 times (e.g. first RM 5000, then RM 1000). The receiving bank does not charge any fees in my case. Only the bank which initiated the transfer charged the fee. However, it hurts me the most for the conversion of the currency (the bank uses different rate). This cannot be avoid. I have on yesterday tried a maybank2u transfer to TDAmeritrade. I initiated at 10am, the account was reflected at night, fast. However, the receiving bank charged USD23 to process it. My advice is if anyone intend to transfer more than RM10K, it may be cheaper to do it at the counter to avoid multiple inward fees charged by foreign bank. Another update is : TDAmeritrade account can now be opened by e-mail in the documents. It will take 2-3 days to be approved if the complete documents are sent. For the international wire transfer from Germany, there are 3 types of transfer. 1) SHARE: I bear all my bank cost, Ameritrade bear all the corresponsing cost. 3) OUR: I pay all the cost include the corresponsing cost. Based on my understanding of SHA, BEN and OUR, if you were transferring money between your own accounts, then there would not be much different in term of cost you pay. The cost should be the same regardless which option you choose. Example: Suppossing the total amount you had was $1000 at bank A, and the total transfer cost was $50. SHA: you paid your bank A $25 to transfer $975 to bank B which took $25 from that transfer, you ended up with $950 at bank B.
BEN: you didn’t pay anything to bank A to transfer $1000 to bank B which took $50 from that transfer, you ended up with $950 at bank B. OUR: you paid $50 to bank A to transfer $950 to bank B where you ended up with $950 at bank B.
Hi, Do I need to fill up the ABA no. in Maybank online? Is there any reason they want to close your account? I am curious and I just sent an inquiry to them about this and am yet to receive their response. TD Ameritrade Asia seems to be targeting people residing in Singapore and Malaysia based on their registration page. There are only two choices for country of residence. The major difference I see is that TD Ameritrade Asia requires at least $3500 to open the account, and the products they are offering are just a subset of what is available at TD Ameritrade. TD Ameritrade Asia does not offer commission-free ETFs at all and they seems to be targeting short-term traders instead of long-term investors based on the products they are offering. And the cost is higher too (although slightly). Hi, I think it’s got to do with new tax laws so US based brokers are closing non-resident accounts. I’m Ok with moving to Singapore but they may need lots more paperwork and may inform Malaysian tax authorities. Here’s the message from TD. You may choose to open an account with TD Ameritrade Asia Pte. Ltd. (“TD Ameritrade Asia”). Thanks for the helpful post, would you mind post an update regarding your account transfer from TD Ameritrade To TD Ameritrade Asia? I just sent my paperwork to TD Ameritrade Asia. Will keep you posted once I have the update. have a newbie question here..
doe the 30% withholding tax for US stock dividends still apply even thou we are trading using a international account like TD Amerittrade? so the advantages are mostly cheaper fees and currency exchange rate only right? It is not the cheapest. Exchange rate is unpredictable. However, it offers a way to participate in the US market. There are lots of alternatives. You just need to find them if you feel this one is not perfectly right for you. If we dont opt for dividends…is there a problem in capital gains too? for example if I keep investing USD 500 every month for next 20 years and then on 20th year…liquidate my holdings….will I have to pay any taxes? Sadly, I think there is no way to avoid paying taxes. I was speaking with TD Live Chat and they informed that minimum amount required is USD 3500 for trading. Is it true? Hmm, unless you need a margin account else there should not be any minimum deposit required for trading. In my case, I first traded when my account was well under USD 2000.
what is this? im Malaysian, isn’t this Singapore stuff? Use the name on your IC (MyKAD) should be OK. What do you mean by not working? Do you know What brokerage for customers that do not require Singaporeans, or Malaysian ? I’m seeking a good one. You can try TD Ameritrade Inc. https://invest.tdameritrade.com/grid/p/accountApplication which is for international investor. If that does not work for you, try Fidelity https://www.fidelity.com/open-account/overview however there is a minimum opening balance of USD2500 required. Thank you for your quick answer. I will try to contact with them to open an trading account. Thank you. I will contact to them. Thank you for your informative posts. I noticed now that this TD Ameritrade is no longer available for either Malaysians or Singaporeans to apply. Please guide me to another good and save investment if possible? I am new to this by the way. My apology if my post is misleading. TD Ameritrade Inc. is no longer open for Malaysian nor Singaporean. But TD Ameritrade Asia is. You can try here https://www.tdameritradeasia.com/tos/myAccounts/displayOpenFirstAccount.tos . They are like terms and conditions that you need to understand and follow when using the trading platform. E.G. : You cannot share the data to others, you also must understand that the data (market price, etc) will sometime be inaccurate under certain conditions and blah blah blah. Thank you for the wonderful post and the time you spent writing out the post. As i’m a citizen of Singapore, do i fill in my ID in line 6 of the W8 form instead of applying ITIN for line 5? For line 7, are they referring to my bank account number? Apology for my newbie question. Line 5, 6 and 7 can be ignored since they are not related for us. Investment using TD Ameritrade will be applied 30% withholding tax. I am wondering if we purchase US stock using Malaysia cross border trading account. Will the US tax still apply? I run across few other brokers on the Internet such as Interactive Brokers, Just2Trade and Eoption. Do you have any experience using those services? What is the pros and cons of them compared to TD Ameritrade or Fidelity? I studied Interactive Brokers some time ago. It is probably the cheapest broker in the world for stock trading but with a catch: there is a monthly minimum commission of USD 10. That is about USD 120 per year of minimum commission to pay and it is a lot for people who don’t trade a lot. It also has a minimum deposit of USD 10000. Interactive Brokers offers a lot of products. For stock alone, you can trade North American, European and Asian markets. I don’t know about Just2Trade and Eoption. Never heard about them before. I think Fidelity is no longer open for international investor the last time I check. There is no way for us to open an account. Correct me if I am wrong. Hi Chok Leong, I have a question regarding withdrawing money from TD Ameritrade, say you want to withdraw some money from TD Ameritrade, it’ll be in USD right? but our local account only accept MYR is that correct? or will the money be converted to MYR once it reached our savings account? Usually the money will be converted to the receiving bank account currency. In this case, it will be MYR unless you have foreign currency account. The conversion rate is also slightly different than the market rate. This is dependent on the banks involved. Hi, I am from Bosnia. Can I open like you from here? I sent them a mail, asked them can I somehow open from here. I will sent them another mail after this. I’ll ask can I open account by sending them a mail. I am not sure. You can try apply directly from the web site https://invest.tdameritrade.com/grid/p/accountApplication and see what happen. Hi Chok Leong, good article. Was your bank statement singed and stamped by the bank? I’m a non-us resident and my bank tells me they don’t stamp or sign statements. The statements I receive by email contains some digital signatures which are meant to verify the authenticity of the bill. What did you do in your case? Also, was your bank statement in English? Mine is in Spanish, so I’m not sure if that will work. Thanks. My bank statement was not signed by bank neither. The electronically generated bank statement was good enough during the time for my application. Not sure if it is still the case. My bank statement was in English. Hi, curious to find out if TD Ameritrade is the lowest brokerage fees to purchase US stocks? Brokers in Malaysia e.g. RHB, Kenanga etc also offer trading in US, HK, etc. Have you made comparison before? I saw in Ameritrade website stating flat rate USD 10+ for trades, is that really the case? No other charges? Thanks in advance. TD Ameritrade does not have the lowest fees to purchase US stocks. There are other lower fee brokers with terms and conditions. I didn’t compare all local brokers. However, I do know for CIMB iTrade the cost for trading US stock is USD 25 per transaction. The commission is around $10 per trade for TD Ameritrade. No other charges. Chokleong thank you for the valuable insights that you shared with us, however I noticed that a wire transfer fee will be charged by local bank (eg. RM25 by maybank). Doesn’t that make my cost of trading become $10.65+RM25 for a transaction? If this is being factored in, then there won’t be much difference by using a local brokerage firm (eg. Alliance bank $20), am I correct? If you are depositing fresh money to your account, the cost is not much different considering the bank charge for the wire transfer. E.G. : $10.65+RM25. For subsequent trading using the fund already in your trading account, the cost will be $10.65. Hi chok, any way to contact through email address? What is the best way to reach vanguard etf with lowest trade?any advise? Vanguard is already the lowest cost ETF provider available. Brokers like TD Ameritrade or Saxo or local investment bank allow investors to buy those funds. Just open a trading account with one of those brokers will do. Thanks, wat about the cheapeat brokerage fee? U reco saxo or td? Hi chokleong, just want to ask did you register an account from TDA (States). I am aware of the TDA (SG) website and im not into their promo package , whereas TDA (States /.com) gives free papertrading account with real time data subscription at no cost. And TBA Malaysian’s are not eligible to get an account from the states. Any tips to get it open from there? Initially, TD Ameritrade Inc. (https://www.tdameritrade.com/home.page) accepted Malaysians to open the account in 2015. But this is no longer the case after the TD Ameritrade Singapore was introduced. I was forced to migrate to TD Ameritrade Singapore. 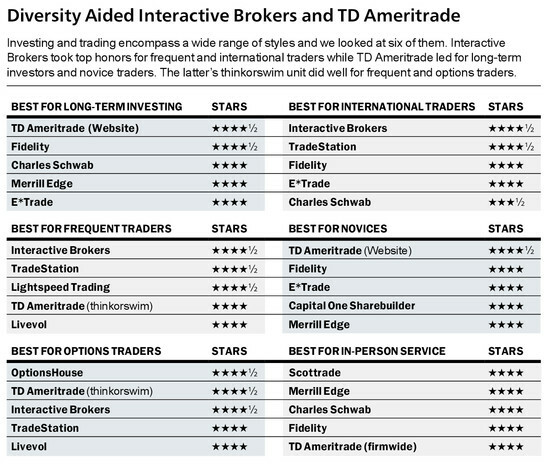 I agree that TD Ameritrade has less features than the US site. I didn’t explore further on this anymore since I moved the account to TD SG. So I don’t know if Malaysian could open the TD Ameritrade US account. Maybe you need an American address to start? I read that Just2Trade is even cheaper but that one need minimum USD2.5k deposit. Hi Chok Leong, I would like to ask. If let’s say we are trading US stock for full time income. Are we eligible for any income tax in Malaysia? As well, the statement provided the TD Ameritrade via electronic would we be able to apply for loan for houses / car etc? Can we transfer funds from a Malaysian bank account to overseas account for option trading with TD Ameritrade? Has anyone done it and is it allowed under BNM guidelines? You can transfer funds from Malaysian bank account to any brokers oversea that let you open account with them. Once the money is deposited into the broker’s account, you can do any trading allowed by the broker. Whether option trading is allowed by BNM, I don’t know anything about it. How to transfer cash from UBS account to TD Ameritrade? how much is the charges to do you know? Based on my record, I did a transfer from UBS to TD Ameritrade initiated on 28 April 2015 and received the fund on 4 May 2015. The cost was USD 11.35 (by deducting the expected amount from UBS from the actual amount received in TD Ameritrade). hi, i newbie here. I plan to do Foreign TT from RHB bank to TDAmeritrade acc. the charges will be RM26.50 for equal or above RM5k. seems like TT money from local bank to TD Ameritrade is cheaper than wire transfer from UBS to TD Ameritrade. How come? If I want to open TD Ameritrade account. Should I open the TD Ameritrade or TD Ameritrade Singapore? Thanks. Hey Chok Leong! Thanks again for the time and detail you put into these posts! I want to revisit a question that’s already been asked here – the 30% withholding tax. Now that you’ve invested in US IFs for a couple of years and have a sense of how the taxes affect returns, what are your thoughts? Does it really hit 30%? I’m a freshie, so will be investing meagre amounts. Wondering if it’s worth looking at US markets at all if returns are going to be significantly dented by taxes. The purpose to invest is to grow the money. Since you asked, I run a quick calculation of the rate of return since 2015 till now (around 3.5 years), the rate of return is around 5.8% per annum. I am happy because the rate of return is positive. I bought only ETFs and no individual stocks. Now back to your question of 30% withhodling tax. It simply means that 30% of your dividend will be taxed. You pay 30 cents tax for every $1 dividend. It will reduce your return but that is the cost of “doing business in the US”. Is it fair to pay the US government tax to invest in the country? This is up to you to decide. If you manage to find better alternative, you can always switch. So I live in Belgium and have asked a lot of times if I can open a td amertrade ThinkOrSwim account. The answer was always no. Even for the whole EU the answer is no. can you please help me and tell me if somehow it is possible for me to open an TOS account in Belgium. thank you. TD Ameritrade only allows you to trade the US markets. There are other online brokers that let you trade the US markets. Hello chok leong, I hope you don’t mind me asking you regarding TD ameritrade SG account in Malaysia. Since opening the account with TD Ameritrade in 2015 till now 2019, I have made 9 deposits. All were successful. I used wire transfers to deposit to TD Ameritrade when I was still using the US account. I also used cheque deposit after moved to TD Ameritrade SG that could take up to 15 days to see the money in my trading account. I never withdraw money from the account yet. However, I just checked, there is a fee of USD 25 to make the international Telegraphic Transfer (TT) for withdrawal. It’s reassuring to know a professional hasn’t had any problem with the platform, and thanks for taking your time to confirm the withdrawal fee. I can see myself sticking with platform for awhile. i’m curious about your 9 wire deposit, does it usually take 15 days to see the money in your account ? what was the average day for the money to show in your account if you can still recall. I am not a professional trader. I am just investing part-time. Usually, the money will be in your account around one week. Definitely not the next day.